Modern kiteflying has changed a lot after Worldwar II. It has little in common with the images on old postcards where kite flying was just a childrens game. This doesn’t mean that there is no attention for history and tradition amongst kitefliers. Modern materials enabled an explosion of creativity and a diversification of the practice. The kite of today is more than a childrens toy. It’s a creative hobby with multiple facets. There is the pleasure of creating, of building, flying and, of course sharing with fellow kite enthusiasts. Getting more experienced, a kiteflier becomes more interested in conceiving and building kites but nobody or nothing can oblige you to make your own kites. The first thing is the joy of flying a kite and the relaxation it ‘ll give you. Most of the experienced kitefliers once started with a kite bought in a shop. There is an enormous number kite models available in the shops that will help you to enjoy kite flying. You will find most of the kite shops on the seaside; but nowadays more and more kite shops are also online. When you feel the appetite to build your own kite you will find useful information in the pages « Plans » of this site to start building. To begin, we must demystify the construction of a kite. There are no high brew techniques you should have to know. Of course you’ll need a sewing machine and have to know how to make a strait seam. For your first kite choose the plan of an “reliable” kite, one that will always fly. In the pages “Construction” you’ll find some plans. A one line kite that is very simple to make and that flies well in various wind conditions is the Japanese Rokkaku Rokakku. 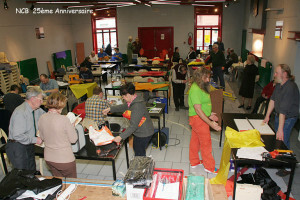 The major steps in making a kite are: first draw the kite in real size, be it with templates of (heavy) cardboard or directly on the fabric, that is well stretched and fixed on the working table. Next step is to cut out the fabric following the lines of the template or drawing. The following step is to add reinforcements on the spots where the sail is attached to the spars. The last step is to make a hem all around the sail. Now the sail is finished. 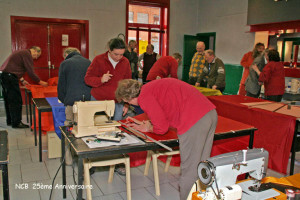 Then comes the structure : all the spars that have to be cut to the exact length, attached together and / or to the sail. The last step is to make the bridle, these are the lines that rely the kite to the flying line and with whom you can adjust the kite so it becomes stable. Some kites need a tail, others don’t. The only things left that you need to fly are a flying line, a reel and a space to fly. Oh… and don’t forget the wind: not too much, a gentle but steady breeze will do most of the time. There are a lot of different kites. One can put them into an number of categories: stunt kites, static kites and traction kites. The popular stunt kites mostly have a triangular delta shape and two lines that enable you to make all kind of manoeuvers. This kite is attracting the most of the beginning kite flyers, because it is fun to fly them and to show how well you can control their flight. There are easy types that fly gently and are more suitable for beginners. But you can buy more sophisticated models that enable complicated acrobatism, called “freestyle”. 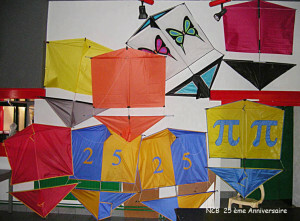 There are also stunt kites with four lines. They can fly in any direction! You can fly forward, stop, backward, stop, turn on the spot, left, right, up, down…(And fall, but that’s only when you’re beginning). Most known type is the “Revolution”. And then, unexpectedly, there are also stunt kites who can be controlled with only one line. You can only pull the line or let it go. So how can you control the kite? It’s simple: the kite itself is unstable but when you pull the line very fast, the kites shape changes just that bit to make it stable and then it will fly in a straight line. With some exercise you will learn to choose the right moment to pull and see the kite going up, down, left, right. These kites are very popular in Asia. They are used in combats. The aim is to cut the opponents line (with so called cutting line). But you can also peacefully ‘fight’ simply by touching the opponents line or simply enjoy the fact that you can maneuver so accurately. There are also one line kites that are made so light that they can glide. When you pull the line they go up. When the line is released they will start to glide. You can even fly them indoor! Most of these kites you will see on festivals. They exist in all shapes, sizes, colors and decorations. They offer you all the possibilities to create, because their only aim is to be beautiful and to decorate the sky. Some of these kites have no rigid structure. The wind simply blows them up and gives them their shape. You can also attach a camera on the line of the static kite and make aerial photography. The camera is operated with a remote control. Sometimes it also has a video return to exactly point the camera. The kite line can also be useful to carry a shuttle that can bring in the air anything you want. Some of the kite flyers launch teddy bears on parachutes or drop candies for the spectators. These big kites are used for kite surfing. Or also on the beach to pull a buggy, a landboard or a mountainboard for more sportive use. These kites are made as light as possible to fly indoor. They exist in 1, 2 or 4 liners. The necessary wind is made by the pilots walking backwards, that’s enough to make them fly. One line kites go up when you pull the line and glide when you let the line go. Just before it touches the ground you let it turn and pull it back up. Most of the kiteflyers practice more than one style. This enables them to choose the ideal kite for the available wind and land conditions. There is a kite for any wind or place, so there is always fun. Some of these meetings are announced op the page « Calendar » of this site. But you can fly anywhere if the land and wind conditions are suitable. Participation on a festival is open for any kiteflyer, experienced or not, with only one small kite or a fleet of huge things. The only thing you have to do is subscribe. These festivals also give you the possibility to meet kite professionals that are invited by the organizers to perform for the public.